Loughborough's Jade Clarke is set to leave the Superleague to join Adelaide Thunderbirds in the ANZ Championship. The 32-year-old re-signed for Lightning for the 2016 season, having returned to England after five years playing in Australia and New Zealand's ANZ league. Clarke will leave after Loughborough's match against Bath on 4 March. "We are extremely disappointed with the way Adelaide Thunderbirds have conducted themselves," executive director of sport John Steele said. "Approaching one of our players directly, midway through the season has been very disruptive and has put our player in a difficult position." 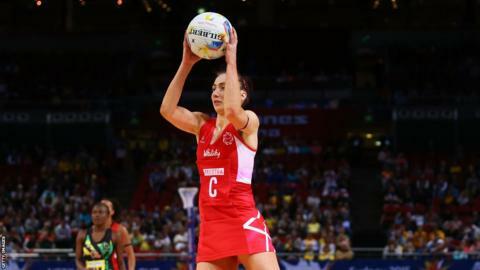 Former England captain Clarke has played in four Netball World Cups and three Commonwealth Games and was captained her country at Glasgow 2014. Loughborough have won two and lost two of their four league matches so far this campaign. "I am devastated for the team that this has happened midway through our 2016 campaign," head coach Karen Atkinson said. "It is a big pull for any player to play in the ANZ but I had hoped the decision would have been a different one."